WDM’s very own Designer turned Journalist, Elise Shapiro, shares her impressions and takeaways from NeoCon 50. A lot has been made of NeoCon’s 50th which wrapped up, June 13th in Chicago. As noted in our pre-show coverage, that is a big milestone for one of the key events in our industry. This was a personal milestone for me, as I have been attending for many (too many to count) years and in many different roles. My first exposure was early in my career, attending the show, four young women, sharing a room at the Conrad Hilton. We were overwhelmed by the city, the Mart and being unleashed on our own to explore and experience. As years passed, I continued to attend as a designer, project manager, judge at Best of NeoCon, speaker, end user and this year, as a journalist. Wow! This was the busiest I have seen in many years. The good news is that The Mart has done a great job working out the way-finding and managing the elevator traffic. Yes, it still is onerous, you must wait in line, and get very friendly with a select crowd on the way up and down to your destination. I do note that people do seem to take in stride as part of the experience and try and plan around the time it takes to get from point A to point B. I did meet several people who took advantage of the stairs to compensate for not hitting the gym for a few days. There were many clues as to what changes in workplace design and furnishings would be in store, just by walking through the ground floor product displays. Once getting to the show floor(s) it was evident that exhibitors are not only taking note of how the workplace has changed, and is evolving, but are perhaps, a driving force in that evolution. For example, I did not see one “traditional” in the sense of work-mode, office set up, (desk, chair, credenza, guest chairs). What the world has become is a place of work nodes and havens that may allow for the trend to free address, work where you are philosophies that are motivating companies to re-think how they approach providing spaces for their employees to get the job done. Also, clear, is the move to creating spaces that are welcoming, sheltering and motivating. The influences on design range from access to advanced technology in communication, presentation and collaboration tools to places that are more akin to a hospitality environment or the dwelling of totally design savvy denizens of the Millennial (and beyond) generations. As we have been reporting on the increasingly blurred lines of what defines space, is work place to be more like home or how do you make a place to work at home – how do we make sense of it all? Well, maybe we don’t need to. Based on what I observed, there are now products coming into the market place that reflect the way people live and work. We are connected all the time, so why does work have to just take place in an office? You are right, it doesn’t. When you are in an office, why do you have to be constrained to one fixed location for the entire day? You are right, now you don’t so much, anymore! Of course, that depends on how your workplace is open to change and willing to be creative in all workplace related endeavors. Knoll’s messaging reinforced the concept that workplaces need to be hospitable – Image by the author. Every showroom featured places designed to be conducive to the way we work now. In fact, at every turn, our totally connected colleagues were working. Whether it was an impromptu meeting, meet up of old friends, managing a phone call, or just taking a break to de-compress and prepare for the next event, there was a place to do so. Many exhibitors are focusing on how their product offerings can promote workplace well being and wellness. As companies are more aware of how their space affects employee engagement, there is more attention being paid to how people feel when they are at work. Emotional well being is becoming as much of a goal as productivity. Designed with lobbies and communal spaces in mind, BuzziSpark invites you to relax into the comfort of an acoustic shelter while you wait. Image courtesy of BuzziSpace. The emphasis on colors, materials, work styles and furniture types that enable flexibility and collaboration become key ingredients in creating spaces that have a positive effect on how people work and find comfort in their work space. Causal meeting spot in the Dauphin showroom – Image by the author. As we become increasingly untethered and there is recognition that not ‘one size fits all” is the norm in workspace design, there needs to be a large menu of product to fill any conceivable type of work situation. Based on what I saw this year, there are multiple options and varied price points and styles to fit the need for today’s workers. Even though more companies are opting to move away from assigned workspace, there is still a big emphasis on systems furniture with individual workspaces. What does seem to be changing is that the systems are more adaptable to change in the field, can be easily reconfigured, or have components that can be switched out as people and teams move about or there is a need to customize by department or use. Some of the detailing on storage, personalization, ergonomics and technology was light years away from what even could have been conceived at the original NeoCon. Examples of new workstation types include a more “deconstructed” individual work area with components to reflect the needs of an individual worker including storage, privacy screen, accessories for personalization. There seems to be a “wherever and whatever” ethos that is now taking over the workplace. As we now can take our technology with us, and have adapted by working on the train, in the airport corridor, waiting in the carpool line, the hotel room, it makes sense that the furniture manufacturers have jumped on the bandwagon to make products that work for workers wherever they may be. Given that conventional, in-person meetings are still in vogue, there were plenty of choices for more conventional meeting spaces. Conference tables are still viable, albeit with more bells and whistles to ensure those in the room can connect with their colleagues across the globe. They can be sized for room type, size and purpose. More thought is being given to how people can best communicate, whether in person or virtually, and the products reflect that. What was interesting was how some manufacturers provided design details that take connectivity into consideration. As one who was tired of crawling under the table to plug in, I imagine I am not the only one to appreciate these thoughtful additions to table design. Let’s not forget that there are still times where people need to be heads down, have some privacy or places to focus. There were several interesting products to achieve that requirement. Meeting Room tables are not going anywhere and at Knoll, come in many sizes, shapes, and materials – Image by the author. Fun goes into the function of workplace design. It is okay to design with some levity and humor to make a more engaging workplace. Think about the materials that go into products. There are many more choices to ensure that sustainability and environmental impact and issues are an important part of design decisions. It is not just office space – designers are incorporating concepts of hospitality and wellness and the comforts of home into the workplace. 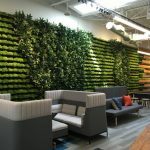 Moss Walls – OK, they were everywhere and our biophilia experts say that biophilic design is not just about putting plants everywhere. Design Elements – We had fun capturing the images of NeoCon 50 – if you are into eye candy, check out our Instagram feed for more. Me, I could live in this space (Herman Miller showroom) – Image by the author. Want to see what specific products caught our eye, and why? Check out our product reviews here.